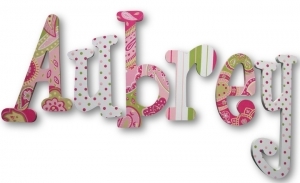 We make custom, hand painted, wood wooden nursery hanging wall letters and accessories to match any and all decor. Choose from thousands of premade designs, or, we can make something totally custom for you! We have decorated thousands of nurseries, children's rooms, playrooms and more and have over 15 years of experience with interior design! We have made letters to match almost anything and everything you can imagine and they look great hanging in your child's room! Growth charts, trash cans, hair bow holders, switch plates, outlet covers, fan blades, tissue box covers and more! If you don't see what you need, please ask! We cut our own items in house and create anything! We also create wood monograms, door monograms, custom painted monograms, wood shapes and anything else you can imagine! We also design wedding decor, cake toppers, cake or gift table decor and more! Email us at theletterboutique@gmail.com for any details or additional information and let us help you make that special space in your home perfect! If you would like to order a custom design instead of a design from our catalog, click here - and don't forget to fill out the custom order form found on the item page! You can be as involved as you like in helping in designing the letters, or leave it up to us and let us get creative!